A Caladium that is more sun tolerant than others, leaves have a rose-red center with wide chartreuse margins, works well in containers. 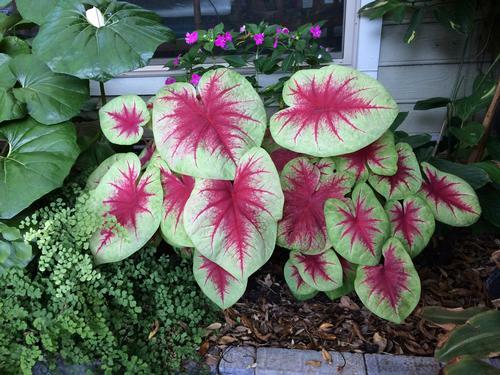 Caladiums are tropical plants that are best known for their colorful foliage and shade tolerance. They prefer moist soil with temperateres above 68 degrees. Plant one jumbo tuber per 6" pot just below the soil surface. Bulbs have been de-eyed for a fuller and more compact plant.